The view of O'Connell Street in Dublin from a pub window. March 17th is St. Patrick’s Day, a day of celebration marked by pints, parades, and ‘the wearing of the green’, but how did this holiday start? The day celebrates Saint Patrick, who was born in Roman Britain and kidnapped by Irish raiders at the age of sixteen. He remained a shepherd slave for six years until directed to escape by a vision. Fleeing captivity, he landed in France and studied to become a priest. In 432 AD Patrick returned to Ireland as a bishop in hopes of converting the Irish to Christianity. Although Patrick never mentioned it in his autobiography Confessio, the shamrock has become associated with his name due a legend in which he used the three leafed plant to explain about the Holy Trinity. St. Patrick’s Day is celebrated each year on the day he is believed to have died – March 17th. Spectators hang from the statue of Daniel O'Connell to view the parade. St. Patrick’s Day has likely been celebrated in Ireland since the sixteenth century, but did not become an official public holiday in the country until 1903. The first St. Patrick’s Day parades took place not in Ireland but in Boston, which claims the world’s first celebration in 1737, and New York City, when Irish soldiers serving in the English military marched through the city in 1762. The first parade in Ireland wasn’t held until 1931. Only in the 1990’s did the Irish government begin using the holiday to showcase Ireland’s culture and attract tourism. This year the St. Patrick’s Festival group celebrates their 15th year, having grown from a three day event to a five day festival. 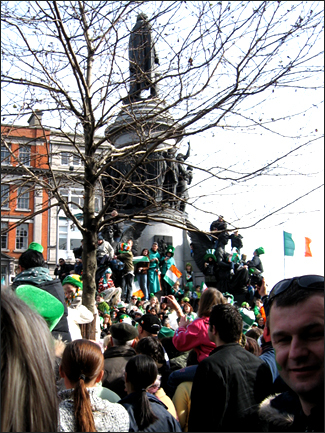 An estimated 675,000 people attended the 2009 parade in Dublin and the Historical Tourist was lucky enough to be one of them! 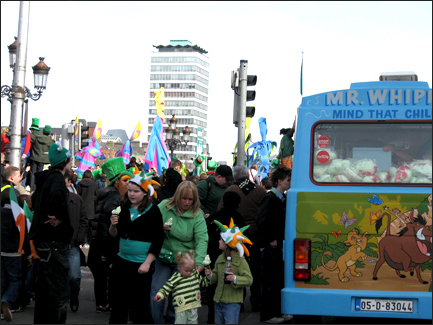 The Saint Patrick’s Day parade in Dublin begins at 12 PM in Parnell Square and winds down O’Connell Street. If you want a good view of the parade be sure to get there early. The Historical Tourist and her roommates took their time and arrived late. As a result we didn’t see much over the crowd of green hats! 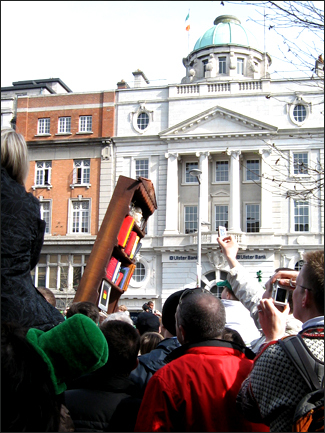 Last year’s parade included floats to celebrate Ireland’s culture and history, including a bookcase symbolizing Ireland’s contribution to literature. Important Irish writers include W.B. Yeats, James Joyce and, of course, Oscar Wilde. Spectators could turn their tongues green for the holiday by purchasing a green ice cream cone, a shamrock shaped lollipop, or even green cotton candy! I opted for the ice cream. We all scream for green ice cream! After the parade I did what every person of legal age in Dublin was doing – I had a pint! While my friends bravely ordered a Guinness, The Historical Tourist, who has never developed a taste for alcohol, stuck to a pint of cider. I also had a shamrock painted on my cheek for the day. This year’s St. Patrick’s Day parade in Dublin will contain over 3000 performers and has the theme “Extraordinary World”. As usual, the five day festival will also include a carnival with a giant wheel in Merrion Square and a celebration of the Irish language and of music. 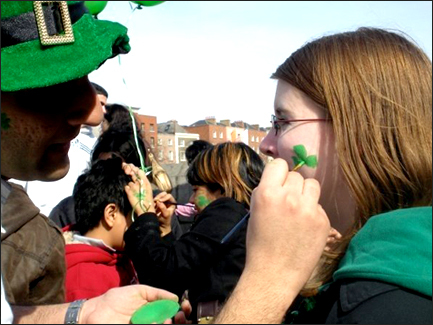 Having my face painted for St. Patrick's Day in Dublin. An interesting article on the fact and fiction of St. Patrick’s Day can be found here, explaining the association of Saint Patrick with the colour green among other things. I wish you all a grand St. Patrick’s Day! I love the Historical Tourist theme. Great post. Happy St. Patrick’s day! Can’t believe it’s been a year!